Dana 60 Ring and Pinion Gear Sets by Revolution Gear & Axle’s are made from the highest quality 8620 material. They are double lapped for easy setup & years of quiet, cool, trouble free operation. 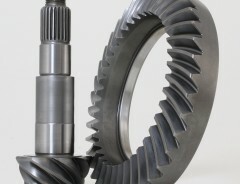 Dana 60 Ring & Pinion gear sets by Revolution are made from the highest quality 8620 material. They are double lapped for easy setup & years of quiet, cool, trouble free operation.